Actual Horn in the FORD F250-See Video. Of course this video does not do justice to just how loud this 155db Behemoth Horn really is!! Our BEHEMOTH Air Horn will literally shake the ground!! This Horn will get the attention of folks blocks away. The Viair 20008 Air System easily can mount in large car's trunk.. 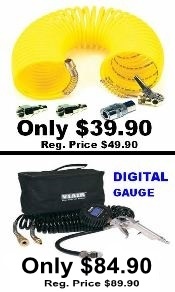 The Viair 20008 Air System can also be used for tire inflation, air lockers, air springs, and even air tools. This BEHEMOTH horn will fit most large Pickups and SUVs. Solenoid(Electric Air Valve): Included (12v Heavy Duty 1/4'' Orifice-Inline Style). Overall Dim: 19.7’’L. x 5.94''W. x 13.9''T. *Compression Fitting for 1/2'' Air Tubing. 0 to 200 PSI -----5 Min. 39 Sec. 165 to 200 PSI -----1 Min. 29 Sec. This Extreme-EZ Behemoth Super Loud, earth shaking train air horn kit will get you noticed and will wake up inattentive drivers that share the road with you. What make this air horn so much louder is not only 200psi of air supply, but also the high flow air solenoid. The solenoid gets mounted between the air tank and the train horn. This allow for the authentic train sound. This is the perfect air horn kit for the serious enthusiasts. This Assured Performance ACHRSK-773 airhorn sold exclusively by Assured Automotive Company. 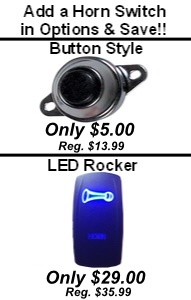 The Behemoth Train Horn will work in large cars, RV, SUV, Semi's and of course make for a great pickup truck air horn. This air horn has zinc trumpets that will not rust. The diaphragm housing are made of cast aluminum polished to a mirror finish. The Behemoth train air horn line is not for the average person, this horn is extremely loud. This Viair 20008 Plug n Play style kit is ready to go. Just wire with an inline fuse. Instructions do suggest using a relay and powering relay through an ignition source and switch inside the vehicle cab. This kit is perfect when out on the trail. The Viair 480c compressor is fast filling and powerful enough to handle most jobs. This High Flow 20008 Viair kit is designed to stand upright, just like is shows in the picture. It can be placed in the trunk of a car or in the bed of a truck. It is NOT designed to be mounted upside down or sideways. This A.P. Air Horn Kit includes all mounting hardware and fitting needed to install this Behemoth Train Air Horn Kit(wiring not included). Don't forget to get your Viair Tire Fill Kit in Options below.